The Qianlong Emperor (25 September 1711 – 7 February 1799) was the sixth emperor of the Manchu-led Qing dynasty, and the fourth Qing emperor to rule over China proper. Born Aisin Gioro Hongli, the fourth son of the Yongzheng Emperor, he reigned officially from 11 October 1735 to 8 February 1796.1 On 8 February, he abdicated in favour of his son, the Jiaqing Emperor – a filial act in order not to reign longer than his grandfather, the illustrious Kangxi Emperor. 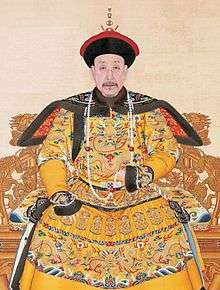 Despite his retirement, however, he retained ultimate power as the Emperor Emeritus (or Retired Emperor) until his death in 1799; he thus was the longest-reigning de facto ruler in the history of China, and dying at the age of 87, the longest-living. As a capable and cultured ruler inheriting a thriving empire, during his long reign the Qing Empire reached its most splendid and prosperous era, boasting a large population and economy, with various military campaigns expand its territory to the largest extent. In his late years, eclipsed in effectiveness of his rule, with rampant corruption and wastefulness in his court, and a stagnant civil society, the empire was in gradual decline. Hongli was adored both by his grandfather, the Kangxi Emperor and his father, the Yongzheng Emperor. Some historians argue that the main reason why the Kangxi Emperor appointed the Yongzheng Emperor as his successor was because Hongli was his favourite grandson. He felt that Hongli's mannerisms were very similar to his own. As a teenager, Hongli was very capable in martial arts and possessed a high literary ability. After his father's enthronement in 1722, Hongli was made a qinwang (first-rank prince) under the title "Prince Bao of the First Rank" (和硕宝亲王; 和碩寶親王; héshuò Bǎo qīnwáng). Like many of his uncles, Hongli entered into a battle of succession with his elder half-brother Hongshi, who had the support of a large faction of the officials in the imperial court, as well as Yinsi, Prince Lian. For many years, the Yongzheng Emperor did not designate any of his sons as the crown prince, but many officials speculated that he favoured Hongli. Hongli went on inspection trips to the south, and was known to be an able negotiator and enforcer. He was also appointed as the chief regent on occasions when his father was away from the capital. Hongli's accession to the throne was already foreseen before he was officially proclaimed emperor before the assembled imperial court upon the death of the Yongzheng Emperor. The young Hongli was the favourite grandson of the Kangxi Emperor and the favourite son of the Yongzheng Emperor; the Yongzheng Emperor had entrusted a number of important ritual tasks to Hongli while the latter was still a prince, and included him in important court discussions of military strategy. In the hope of preventing a succession struggle from occurring, the Yongzheng Emperor wrote the name of his chosen successor on a piece of paper and placed it in a sealed box secured behind the tablet over the throne in the Palace of Heavenly Purity (Qianqing Palace). The name in the box was to be revealed to other members of the imperial family in the presence of all senior ministers only upon the death of the emperor. When the Yongzheng Emperor died suddenly in 1735, the will was taken out and read before the entire Qing imperial court, after which Hongli became the new emperor. Hongli adopted the era name "Qianlong" (乾隆), which is composed of the characters 乾 (lit. "heaven") and 隆 (lit. "eminence") and which collectively mean "Lasting Eminence". 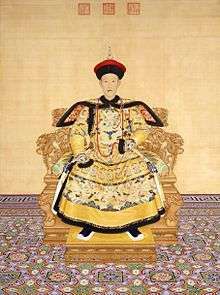 Military attire of the Qianlong Emperor. Musée de l'Armée, Paris. A soldier from the Qianlong era, by William Alexander, 1793. The Qianlong Emperor watching a wrestling match. 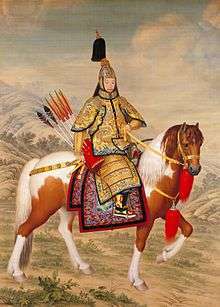 The Qianlong Emperor in Ceremonial Armour on Horseback, by Italian Jesuit Giuseppe Castiglione (known as Lang Shining in Chinese) (1688–1766). The Qianlong Emperor was a successful military leader. Immediately after ascending the throne, he sent armies to suppress the Miao rebellion. His later campaigns greatly expanded the territory controlled by the Qing Empire. This was made possible not only by Qing military might, but also by the disunity and declining strength of the Inner Asian peoples. Under the Qianlong Emperor's reign, the Dzungar Khanate was incorporated into the Qing Empire's rule and renamed Xinjiang, while to the west, Ili was conquered and garrisoned. The incorporation of Xinjiang into the Qing Empire resulted from the final defeat and destruction of the Dzungars (or Zunghars), a coalition of Western Mongol tribes. The Qianlong Emperor then ordered the Dzungar genocide. According to the Qing dynasty scholar Wei Yuan, 40% of the 600,000 Dzungars were killed by smallpox, 20% fled to the Russian Empire or Kazakh tribes, and 30% were killed by the Qing army, in what Michael Edmund Clarke described as "the complete destruction of not only the Zunghar state but of the Zunghars as a people." Historian Peter Perdue has argued that the decimation of the Dzungars was the result of an explicit policy of massacre launched by the Qianlong Emperor. Khalkha Mongol rebels under Prince Chingünjav had plotted with the Dzungar leader Amursana and led a rebellion against the Qing Empire around the same time as the Dzungars. The Qing army crushed the rebellion and executed Chingünjav and his entire family. For the compilation of works on the Dzungar campaign like Strategy for the pacification of the Dzungars (Pingding Zhunge'er fanglue), the Qing Empire hired Zhao Yi and Jiang Yongzhi at the Military Archives Office, in their capacity as members of the Hanlin Academy. Poems glorifying the Qing conquest and genocide of the Dzungar Mongols were written by Zhao. Zhao Yi wrote the Yanpu zaji in "brush-notes" style, where military expenditures of the Qianlong Emperor's reign were recorded. The Qianlong Emperor was praised as being the source of "eighteenth-century peace and prosperity" by Zhao Yi. The Dzungar genocide has been compared to the Qing extermination of the Jinchuan Tibetan people in 1776, which also occurred during the Qianlong Emperor's reign. When victorious troops returned to Beijing, a celebratory hymn was sung in their honour. A Manchu version of the hymn was recorded by the Jesuit Amoit and sent to Paris. Throughout this period there were continued Mongol interventions in Tibet and a reciprocal spread of Tibetan Buddhism in Mongolia. After the Lhasa riot of 1750, the Qianlong Emperor sent armies into Tibet and firmly established the Dalai Lama as the ruler of Tibet, with a Qing resident and garrison to preserve Qing presence. Further afield, military campaigns against Nepalese and Gurkhas forced these peoples to submit and send tribute. The Qianlong Emperor sought to conquer Burma to the south, but the Sino-Burmese War ended in complete failure. He initially believed that it would be an easy victory against a barbarian tribe, and sent only the Green Standard Army based in Yunnan, which borders Burma. The Qing invasion came as the majority of Burmese forces were deployed in their latest invasion of the Siamese Ayutthaya Kingdom. Nonetheless, battle-hardened Burmese troops defeated the first two invasions of 1765–66 and 1766–67 at the border. The regional conflict now escalated to a major war that involved military manoeuvres nationwide in both countries. The third invasion (1767–1768) led by the elite Manchu Bannermen nearly succeeded, penetrating deep into central Burma within a few days' march from the capital, Ava. However, the Manchu Bannermen of northern China could not cope with "unfamiliar tropical terrains and lethal endemic diseases", and were driven back with heavy losses. After the close-call, King Hsinbyushin redeployed his armies from Siam to the Chinese front. The fourth and largest invasion got bogged down at the frontier. With the Qing forces completely encircled, a truce was reached between the field commanders of the two sides in December 1769. The Qing forces kept a heavy military lineup in the border areas of Yunnan for about one decade in an attempt to wage another war while imposing a ban on inter-border trade for two decades. When Burma and China resumed a diplomatic relationship in 1790, the Qing government unilaterally viewed the act as Burmese submission, and claimed victory. The circumstances in Vietnam were not successful either. In 1787, Lê Chiêu Thống, the last ruler of the Vietnamese Lê dynasty, fled from Vietnam and formally requested to be restored to his throne in Thanglong (present-day Hanoi). The Qianlong Emperor agreed and sent a large army into Vietnam to remove the Tây Sơn (peasant rebels who had captured all of Vietnam). The capital, Thanglong, was conquered in 1788 but a few months later, the Qing army was defeated and the invasion turned into a débâcle due to the surprise attack during Tết (Vietnamese New Year) by Nguyễn Huệ, the second and most capable of the three Tây Sơn brothers. The Qing Empire gave formal protection to Lê Chiêu Thống and his family, and would not intervene in Vietnam for another 90 years. Despite setbacks in the south, overall, the Qianlong Emperor's military expansion nearly doubled the area of the already vast Qing Empire, and brought into the fold many non-Han-Chinese peoples – such as Uyghurs, Kazakhs, Kyrgyzs, Evenks and Mongols – who were potentially hostile. It was also a very expensive enterprise; the funds in the Imperial Treasury were almost all put into military expeditions. Though the wars were successful, they were not overwhelmingly so. The Qing army declined noticeably and had a difficult time facing some enemies: the campaign against the Jinchuan hill peoples took 2–3 years – at first the Qing army were mauled, though Yue Zhongqi (a descendant of Yue Fei) later took control of the situation. The battle with the Dzungars was closely fought, and caused heavy losses on both sides. At the end of the frontier wars, the Qing army had started to weaken significantly. In addition to a more lenient military system, warlords became satisfied with their lifestyles. Since most of the warring had taken place, warlords no longer saw any reason to train their armies, resulting in a rapid military decline by the end of the Qianlong Emperor's reign. This was the main reason for the Qing military's failure to suppress the White Lotus Rebellion, which started towards the end of the Qianlong Emperor's reign and extended into the reign of the Jiaqing Emperor. The Qianlong Emperor, like his predecessors, took his cultural role seriously. First of all, he worked to preserve the Manchu heritage, which he saw as the basis of the moral character of the Manchus and thus of the dynasty's power. He ordered the compilation of Manchu language genealogies, histories, and ritual handbooks and in 1747 secretly ordered the compilation of the Shamanic Code, published later in the Siku Quanshu. He further solidified the dynasty's cultural and religious claims in Central Asia by ordering a replica of the Potala Palace, the Tibetan temple, to be built on the grounds of the imperial summer palace in Chengde. In order to present himself to Tibetans and Mongols in Buddhist rather than in Confucian terms, he commissioned a thangka, or sacred painting, depicting him as Manjusri, the Bodhisattva of Wisdom. The imperial collection had its origins in the first century BC, and had gone through many vicissitudes of fire, civil wars and foreign invasions in the centuries that followed. But it was Qianlong who lavished the greatest attention on it, certainly of any of the Manchu rulers... One of the many roles played by Qianlong, with his customary diligence, was that of the emperor as collector and curator. ...how carefully Qianlong followed the art market in rare paintings and antiquities, using a team of cultural advisers, from elderly Chinese literati to newly fledged Manchu connoisseurs. These men would help the emperor spot which great private collections might be coming up for sale, either because the fortunes of some previously rich merchant family were unraveling or because the precious objects acquired by Manchu or Chinese grandees during the chaos of the conquest period were no longer valued by those families' surviving heirs. Sometimes, too, Qianlong would pressure or even force wealthy courtiers into yielding up choice art objects: he did this by pointing out failings in their work, which might be excused if they made a certain "gift", or, in a couple of celebrated cases, by persuading the current owners that only the secure walls of the forbidden City and its guardians could save some precious painting from theft or from fire. The Qianlong Emperor's massive art collection became an intimate part of his life; he took landscape paintings with him on his travels in order to compare them with the actual landscapes, or to hang them in special rooms in palaces where he lodged, to inscribe them on every visit there. "He also regularly added poetic inscriptions to the paintings of the imperial collection, following the example of the emperors of the Song dynasty and the literati painters of the Ming dynasty. They were a mark of distinction for the work, and a visible sign of his rightful role as emperor. Most particular to the Qianlong Emperor is another type of inscription, revealing a unique practice of dealing with works of art that he seems to have developed for himself. On certain fixed occasions over a long period he contemplated a number of paintings or works of calligraphy which possessed special meaning for him, inscribing each regularly with mostly private notes on the circumstances of enjoying them, using them almost as a diary." "Most of the several thousand jade items in the imperial collection date from his reign. The (Qianlong) Emperor was also particularly interested in collecting ancient bronzes, bronze mirrors and seals," in addition to pottery, ceramics and applied arts such as enameling, metal work and lacquer work, which flourished during his reign; a substantial part of his collection is in the Percival David Foundation in London. 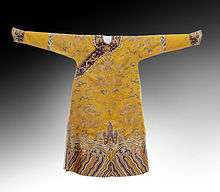 The Victoria and Albert Museum and British Museum also have collections of art from the Qianlong era. "The Qianlong Emperor was a passionate poet and essayist. In his collected writings, which were published in a tenfold series between 1749 and 1800, over 40,000 poems and 1,300 prose texts are listed, making him one of the most prolific writers of all time. There is a long tradition of poems of this sort in praise of particular objects ('yongwu shi), and the Qianlong Emperor used it in order to link his name both physically and intellectually with ancient artistic tradition." One of the Qianlong Emperor's grandest projects was to "assemble a team of China's finest scholars for the purpose of assembling, editing, and printing the largest collection ever made of Chinese philosophy, history, and literature." Known as the Four Treasuries Project (or Siku Quanshu), it was published in 36,000 volumes, containing about 3450 complete works and employing as many as 15,000 copyists. It preserved numerous books, but was also intended as a way to ferret out and suppress political opponents, requiring the "careful examination of private libraries to assemble a list of around eleven thousand works from the past, of which about a third were chosen for publication. The works not included were either summarised or – in a good many cases – scheduled for destruction." Some 2,300 works were listed for total suppression and another 350 for partial suppression. The aim was to destroy the writings that were anti-Qing or rebellious, that insulted previous "barbarian" dynasties, or that dealt with frontier or defence problems. The full editing of the Siku Quanshu was completed in about ten years; during these ten years, 3100 titles (or works), about 150,000 copies of books were either burnt or banned. Of those volumes that had been categorised into the Siku Quanshu, many were subjected to deletion and modification. Books published during the Ming dynasty suffered the greatest damage. The authority would judge any single character or any single sentence's neutrality; if the authority had decided these words, or sentence were derogatory or cynical towards the rulers, then persecution would begin. 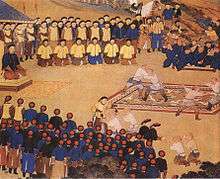 In the Qianlong Emperor's time, there were 53 cases of literary inquisition, resulting in the victims executed by beheading or slow slicing (lingchi), or having their corpses mutilated (if they were already dead). In 1743, after his first visit to Mukden (present-day Shenyang, Liaoning), the Qianlong Emperor used Chinese to write his "Ode to Mukden," (Shengjing fu/Mukden-i fujurun bithe), a fu in classical style, as a poem of praise to Mukden, at that point a general term for what was later called Manchuria, describing its beauties and historical values. He describes the mountains and wildlife, using them to justify his belief that the dynasty would endure. A Manchu translation was then made. In 1748, he ordered a jubilee printing in both Chinese and Manchu, using some genuine pre-Qin forms, but Manchu styles which had to be invented and which could not be read. In his childhood, the Qianlong Emperor was tutored in Manchu, Chinese and Mongolian, arranged to be tutored in Tibetan, and spoke Chagatai (Turki or Modern Uyghur) and Tangut. However, he was even more concerned than his predecessors to preserve and promote the Manchu language among his followers, as he proclaimed that "the keystone for Manchus is language." He commissioned new Manchu dictionaries, and directed the preparation of the Pentaglot Dictionary which gave equivalents for Manchu terms in Mongolian, Tibetan and Turkic, and had the Buddhist canon translated into Manchu, which was considered the "national language". He directed the elimination of loanwords taken from Chinese and replaced them with calque translations which were put into new Manchu dictionaries. Manchu translations of Chinese works during his reign were direct translations contrasted with Manchu books translated during the Kangxi Emperor's reign which were transliterations in Manchu script of the Chinese characters. The Qianlong Emperor commissioned the Yuding Xiyu Tongwen Zhi (欽定西域同文志; "Imperial Western Regions Thesaurus") which was a thesaurus of geographic names in Xinjiang in Oirat Mongol, Manchu, Chinese, Tibetan, and Turki (Modern Uyghur). The long association of the Manchu rulership with the Bodhisattva Manjusri and his own interest in Tibetan Buddhism gave credence to the Qianlong Emperor's patronage of Tibetan Buddhist art and patronage of translations of the Buddhist canon. The accounts in court records and Tibetan language sources affirm his personal commitment. He quickly learned to read the Tibetan language and studied Buddhist texts assiduously. His beliefs are reflected in the Tibetan Buddhist imagery of his tomb, perhaps the most personal and private expression of an emperor's life. He supported the Yellow Church (the Tibetan Buddhist Gelukpa sect) to "maintain peace among the Mongols" since the Mongols were followers of the Dalai Lama and Panchen Lama of the Yellow Church, and the Qianlong Emperor had this explanation placed in the Yonghe Temple in Beijing on a stele entitled "Lama Shuo" (on Lamas) in 1792, and he also said it was "merely in pursuance of Our policy of extending Our affection to the weak." which led him to patronize the Yellow Church. Mark Elliott concludes that these actions delivered political benefits but "meshed seamlessly with his personal faith." This explanation of supporting the "Yellow Hats" Tibetan Buddhists for practical reasons was used to deflect Han criticism of this policy by the Qianlong Emperor, who had the "Lama Shuo" stele engraved in Tibetan, Mongol, Manchu and Chinese, which said: "By patronising the Yellow Church we maintain peace among the Mongols. This being an important task we cannot but protect this (religion). (In doing so) we do not show any bias, nor do we wish to adulate the Tibetan priests as (was done during the) Yuan dynasty." The Qianlong Emperor turned the Palace of Harmony (Yonghe Palace) into a Tibetan Buddhist temple for Mongols in 1744 and had an edict inscribed on a stele to commemorate it in Tibetan, Mongolian, Chinese, and Manchu, with most likely the Qianlong Emperor having first wrote the Chinese version before the Manchu. The Qianlong Emperor was an aggressive builder. In the hills northwest of Beijing, he expanded the villa known as the "Garden of Perfect Brightness" (Yuanmingyuan) (now known as the Old Summer Palace) that was built by his father. He eventually added two new villas, the "Garden of Eternal Spring" and the "Elegant Spring Garden". In time, the Old Summer Palace would encompass 860 acres (350 hectares), five times larger than the Forbidden City. To celebrate the 60th birthday of his mother, Empress Dowager Chongqing, the Qianlong Emperor ordered a lake at the "Garden of Clear Ripples" (Qingyiyuan) (now known as the Summer Palace) dredged, named it Kunming Lake, and renovated a villa on the eastern shore of the lake. The Qianlong Emperor also expanded the imperial summer palace in Rehe Province, beyond the Great Wall. Rehe eventually became effectively a third capital and it was at Rehe that the Qianlong Emperor held court with various Mongol nobles. The emperor also spent time at the Mulan hunting grounds north of Rehe, where he held the imperial hunt each year. For the Old Summer Palace, the Qianlong Emperor commissioned the Italian Jesuit Giuseppe Castiglione for the construction of the Xiyang Lou, or Western-style mansion, to satisfy his taste for exotic buildings and objects. He also commissioned the French Jesuit Michel Benoist, to design a series of timed waterworks and fountains complete with underground machinery and pipes, for the amusement of the imperial family. The French Jesuit Jean Denis Attiret also became a painter for the emperor. Jean-Damascène Sallusti was also a court painter. He co-designed, with Castiglione and Ignatius Sichelbart, the Battle Copper Prints. During the Qianlong Emperor's reign, the Emin Minaret was built in Turpan to commemorate Emin Khoja, a Uyghur leader from Turfan who submitted to the Qing Empire as a vassal in order to obtain assistance from the Qing to fight the Zunghars. In 1725, the Yongzheng Emperor bestowed a hereditary marquis title on a descendant of Zhu Zhilian, a descendant of the imperial family of the Ming dynasty. Zhu was also paid by the Qing government to perform rituals at the Ming tombs and induct the Chinese Plain White Banner into the Eight Banners. Zhu was posthumously awarded the title "Marquis of Extended Grace" in 1750, and the title was passed on for 12 generations in his family until the end of the Qing dynasty. The Qianlong Emperor instituted a policy of "Manchu-fying" the Eight Banner system, which was the basic military and social organisation of the dynasty. In the early Qing era, Nurhaci and Huangtaiji categorised Manchu and Han ethnic identity within the Eight Banners based on culture, lifestyle and language, instead of ancestry or genealogy. Han Bannermen were an important part of the Banner System. The Qianlong Emperor changed this definition to one of descent, and demobilised many Han Bannermen and urged Manchu Bannermen to protect their cultural heritage, language and martial skills. 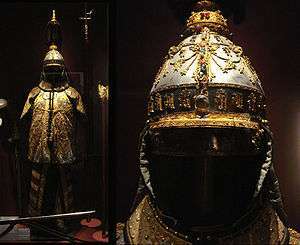 The emperor redefined the identity of Han Bannermen by saying that they were to be regarded as of having the same culture and being of the same ancestral extraction as Han civilians Conversely, he emphasised the martial side of Manchu culture and reinstituted the practice of the annual imperial hunt as begun by his grandfather, leading contingents from the Manchu and Mongol banners to the Mulan hunting grounds each autumn to test and improve their skills. The Qianlong Emperor's view of the Han Bannermen also differed from that of his grandfather in deciding that loyalty in itself was most important quality. He sponsored biographies which depicted Chinese Bannermen who defected from the Ming to the Qing as traitors and glorifing Ming loyalists. Some of the Qianlong Emperor's inclusions and omissions on the list of traitors were political in nature. Some of these actions were including Li Yongfang (out of his dislike for Li Yongfang's descendant, Li Shiyao) and excluding Ma Mingpei (out of concern for his son Ma Xiongzhen's image). The identification and interchangeability between "Manchu" and "Banner people" (Qiren) began in the 17th century. Banner people were differentiated from civilians (Chinese: minren, Manchu: irgen, or Chinese: Hanren, Manchu :Nikan) and the term Bannermen was becoming identical with "Manchu" in the general perception. The Qianlong Emperor referred to all Bannermen as Manchu, and Qing laws did not say "Manchu" but "Bannermen". The Qianlong Emperor granted the title of Wujing Boshi (五经博士; 五經博士; Wǔjīng Bóshì) to the descendants of Zhang Zai, Fu Sheng (scholar), and Yan Hui. The Manchu prince Abatai's daughter was married to the Han Chinese general Li Yongfang (李永芳). The offspring of Li received the "Third Class Viscount" (三等子爵; sān děng zǐjué) title. Li Yongfang was the great great great grandfather of Li Shiyao (李侍堯) who, during the Qianlong Emperor's reign, was involved in graft and embezzlement, demoted of his noble title and sentenced to death, however his life was spared and he regained his title after assisting in the Taiwan campaign. The Qianlong Emperor and his predecessors, since the Shunzhi Emperor, had identified China and the Qing Empire as the same, and in treaties and diplomatic papers the Qing Empire called itself "China". The Qianlong Emperor rejected earlier ideas that only Han could be subjects of China and only Han land could be considered as part of China, so he redefined China as multiethnic, saying in 1755 that "there exists a view of China (zhongxia), according to which non-Han people cannot become China's subjects and their land cannot be integrated into the territory of China. This does not represent our dynasty's understanding of China, but is instead that of the earlier Han, Tang, Song, and Ming dynasties." The Qianlong Emperor rejected the views of Han officials who said Xinjiang was not part of China and that he should not conquer it, putting forth the view that China was multiethnic and did not just refer to Han. The Qianlong Emperor compared his achievements with that of the Han and Tang ventures into Central Asia. Han Chinese farmers were resettled from north China by the Qing government in the area along the Liao River in order to restore the land to cultivation. Wasteland was reclaimed by Han squatters in addition to other Han people who rented land from Manchu landlords. Despite officially prohibiting Han settlement on the Manchu and Mongol lands, by the 18th century the Qing government decided to settle Han refugees from northern China who were suffering from famine, floods, and drought into Manchuria and Inner Mongolia. Due to this, Han people farmed 500,000 hectares in Manchuria and tens of thousands of hectares in Inner Mongolia by the 1780s. The Qianlong Emperor allowed Han peasants suffering from drought to move into Manchuria despite him issuing edicts in favor of banning them from 1740-76. Han tenant farmers rented or even claimed title to land from the "imperial estates" and Manchu Bannerlands in the area. Besides moving into the Liao area in southern Manchuria, the path linking Jinzhou, Fengtian, Tieling, Changchun, Hulun, and Ningguta was settled by Han people during the Qianlong Emperor's reign, and Han people were the majority in urban areas of Manchuria by 1800. To increase the Imperial Treasury's revenue, the Qing government sold lands along the Sungari which were previously exclusively for Manchus to Han Chinese at the beginning of the Daoguang Emperor's reign, and Han people filled up most of Manchuria's towns by the 1840s, according to Abbé Huc. In his later years, the Qianlong Emperor became spoiled with power and glory, disillusioned and complacent in his reign, and started placing his trust in corrupt officials such as Yu Minzhong and Heshen. As Heshen was the highest ranked minister and most favoured by the Qianlong Emperor at the time, the day-to-day governance of the country was left in his hands, while the emperor himself indulged in the arts, luxuries and literature. When Heshen was executed by the Jiaqing Emperor, the Qing government discovered that Heshen's personal fortune exceeded that of the Qing Empire's depleted treasury, amounting to 900 million silver taels, the total of 12 years of Treasury surplus of the Qing imperial court. The Qianlong Emperor began his reign with about 33.95 million silver taels in Treasury surplus. At the peak of his reign, around 1775, even with further tax cuts, the treasury surplus still reached 73.9 million silver taels, a record unmatched by his predecessors, the Kangxi and Yongzheng emperors, both of whom had implemented remarkable tax cut policies. However, due to numerous factors such as long term embezzlement and corruption by officials, frequent expeditions to the south, huge palace constructions, many war and rebellion campaigns as well as his own extravagant lifestyle, all of these cost the treasury a total of 150.2 million silver taels. This, coupled with his senior age and the lack of political reforms, ushered the beginning of the gradual decline and eventual demise of the Qing Empire, casting a shadow over his glorious and brilliant political life. 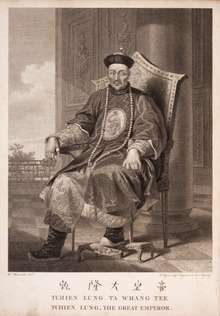 The French Jesuit Joseph-Marie Amiot (1718–1793) was the official translator of Western languages for the Qianlong Emperor. 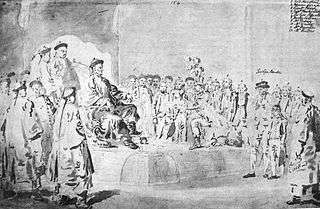 Illustration depicting the last European delegation to be received at the Qianlong Emperor's court in 1795 – Isaac Titsingh (seated European with hat, far left) and A.E. van Braam Houckgeest (seated European without hat). During the mid-18th century, the Qianlong Emperor began to face pressures from the West to increase foreign trade. The proposed cultural exchange between the British Empire at the time and the Qing Empire collapsed due to many factors. Firstly, there was a lack of any precedent interaction with overseas foreign kingdoms apart from neighbouring tributory states to guide the Qianlong Emperor towards a more informed response. Furthermore, competing worldviews that were incompatible between China and Britain, the former holding entrenched beliefs that China was the "central kingdom", and the latter's push for rapid liberalisation of trade relations, worsened ties. George Macartney was sent by King George III as ambassador extraordinary to congratulate the Qianlong Emperor on his 82th birthday and – more importantly – to seek a range of trade concessions. He was granted an audience with the Qianlong Emperor on two separate days, the second of which coincided with the emperor's 82nd birthday. There is continued discussion about the nature of the audience, and what level of ceremonials were performed. Demands from the Qing court that the British trade ambassadors kneel and perform the kowtow were strongly resisted by Macartney, and debate continues as to what exactly occurred, differing opinions recorded by Qing courtiers and British delegates. The Emperor is about five feet ten inches in height, and of a slender but elegant form; his complexion is comparatively fair, though his eyes are dark; his nose is rather aquiline, and the whole of his countenance presents a perfect regularity of feature, which, by no means, announce the great age he is said to have attained; his person is attracting, and his deportment accompanies by an affability, which, without lessening the dignity of the prince, evinces the amiable character of the man. His dress consisted of a loose robe of yellow silk, a cap of black velvet with a red ball on the top, and adorned with a peacock's feather, which is the peculiar distinction of mandarins of the first class. He wore silk boots embroidered with gold, and a sash of blue girded his waist. It is uncertain whether Anderson actually saw the Qianlong Emperor, or repeated another's sighting, as he was not involved in the ceremonies. A Dutch embassy arrived at the Qianlong Emperor's in 1795, and would turn out to be the last occasion in which any European appeared before the Qing imperial court within the context of traditional Chinese imperial foreign relations. Representing Dutch and Dutch East India Company interests, Isaac Titsingh traveled to Beijing in 1794–95 for celebrations of the 60th anniversary of the Qianlong Emperor's reign. The Titsingh delegation also included the Dutch-American Andreas Everardus van Braam Houckgeest, whose detailed description of this embassy to the Qing court was soon after published in the United States and Europe. Titsingh's French translator, Chrétien-Louis-Joseph de Guignes published his own account of the Titsingh mission in 1808. Voyage a Pékin, Manille et l'Ile de France provided an alternate perspective and a useful counterpoint to other reports which were then circulating. Titsingh himself died before he could publish his version of events. In contrast to Macartney, Isaac Titsingh, the Dutch and VOC emissary in 1795 did not refuse to kowtow. In the year following Mccartney's rebuff, Titsingh and his colleagues were much feted by the Chinese because of what was construed as seemly compliance with conventional court etiquette. In October 1795, the Qianlong Emperor officially announced that in the spring of the following year he would voluntarily abdicate his throne and pass the throne to his son. It was said that the Qianlong Emperor had made a promise during the year of his ascension not to rule longer than his grandfather, the Kangxi Emperor, who had reigned for 61 years. The Qianlong Emperor anticipated moving out of the Hall of Mental Cultivation (Yangxindian) in the Forbidden City. The hall had been conventionally dedicated for the exclusive use of the reigning sovereign, and in 1771 the emperor ordered the beginning of construction on what was ostensibly intended as his retirement residence in another part of the Forbidden City: a lavish, two-acre walled retreat called the "Palace of Tranquil Longevity (Ningshou Palace)", which is today more commonly known as the "Qianlong Garden". The complex, completed in 1776, is currently undergoing a ten-year restoration led by the Palace Museum in Beijing and the World Monuments Fund (WMF). The first of the restored apartments, the Qianlong Emperor's Juanqinzhai, or "Studio of Exhaustion From Diligent Service," began an exhibition tour of the United States in 2010. The Qianlong Emperor relinquished the throne at the age of 85, in the 60th year of his reign, to his son, the Jiaqing Emperor, in 1795. For the next four years, he held the title "Taishang Huang (or Retired Emperor)" (太上皇) even though he continued to hold on to power and the Jiaqing Emperor ruled only in name. He never moved into his retirement suites in the Qianlong Garden. He died in 1799. 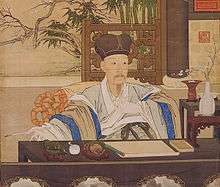 A legend, popularised in fiction, says that the Qianlong Emperor was the son of Chen Shiguan (陳世倌), a Han Chinese official from Haining County, Zhejiang Province. In his choice of heir to the throne, the Kangxi Emperor required not only that the heir be able to govern the empire well but that the heir's son be of no less calibre, thus ensuring the Manchus' everlasting reign over China. The son of Yinzhen, the Kangxi Emperor's fourth son, was a weakling so Yinzhen surreptitiously arranged for his daughter to be exchanged for Chen Shiguan's son, who became the favourite grandson of the Kangxi Emperor. Yinzhen succeeded his father and became the Yongzheng Emperor, while his "son", Hongli, succeeded him in turn as the Qianlong Emperor. During his reign, the Qianlong Emperor went on inspection tours to southern China and stayed in Chen Shiguan's house in Haining, where he wrote calligraphy. He also frequently issued imperial edicts to waive off taxes from Haining County. However, there are major problems with this story. First, the Yongzheng Emperor's eldest surviving son, Hongshi, was only seven when Hongli was born, far too young to make the drastic choice of replacing a child of imperial birth with an outsider (and risking disgrace if not death). Second, the Yongzheng Emperor had three other princes who survived to adulthood and had the potential to ascend the throne. Indeed, since Hongshi was the son forced to commit suicide, it would have been far more logical for him to be the adopted son, if any of them were. Stories about the Qianlong Emperor's six inspection tours to southern China in disguise as a commoner have been a popular topic for many generations. In total, he visited southern China six times – the same number of times as his grandfather, the Kangxi Emperor. ^1 The Qianlong era name, however, started only on 12 February 1736, the first day of that lunar year. 8 February 1796 was the last day of the lunar year known in Chinese as the 60th year of Qianlong. 1 2 Jacobs, Andrew. "Dusting Off a Serene Jewel Box," New York Times. 31 December 2008. 1 2 Perdue 2005, p. 287. ↑ Clarke 2004, p. 37. ↑ Man-Cheong, Iona (2004). Class of 1761. Stanford University Press. p. 180. ISBN 0804767130. Retrieved 24 April 2014. ↑ Schmidt, J. D. (2013). Harmony Garden: The Life, Literary Criticism, and Poetry of Yuan Mei (1716-1798). Routledge. p. 444. ISBN 1136862250. Retrieved 24 April 2014. ↑ Schmidt, Jerry D. (2013). The Poet Zheng Zhen (1806-1864) and the Rise of Chinese Modernity. BRILL. p. 394. ISBN 9004252290. Retrieved 24 April 2014. ↑ Theobald, Ulrich (2013). War Finance and Logistics in Late Imperial China: A Study of the Second Jinchuan Campaign (1771–1776). BRILL. p. 32. ISBN 9004255672. Retrieved 24 April 2014. ↑ Chang, Michael G. (2007). A Court on Horseback: Imperial Touring & the Construction of Qing Rule, 1680-1785. Volume 287 of Harvard East Asian monographs (illustrated ed.). Harvard University Asia Center. p. 435. ISBN 0674024540. Retrieved 24 April 2014. ↑ Theobald, Ulrich (2013). War Finance and Logistics in Late Imperial China: A Study of the Second Jinchuan Campaign (1771–1776). BRILL. p. 21. ISBN 9004255672. Retrieved 22 April 2014. ↑ "Manchu hymn chanted at the occasion of the victory over the Jinchuan Rebels". Manchu Studies Group. 2012-12-18. Retrieved 2013-02-19. ↑ Dabringhaus, Sabine (2011). "Staatsmann, Feldherr und Dichter". Damals (in German). Vol. 43 no. 1. pp. 16–24. ↑ Schirokauer, Conrad & Clark, Donald N. Modern East Asia: A Brief History, 2nd ed. pp. 35. Houghton Mifflin Company. Boston & New York. 2008 ISBN 978-0-618-92070-9. ↑ Jonathan D. Spence. The Search for Modern China. (New York: Norton, 3rd, 2013 ISBN 9780393934519), p. 98. 1 2 3 4 5 Holzworth, Gerald (12 November 2005). "China: the Three Emperors 1662–1795". The Royal Academy of Arts. ↑ Alexander Woodside, "The Ch’ien-Lung Reign," in Peterson, Willard J. (December 2002). The Cambridge History of China. Cambridge University Press. p. 290. ISBN 978-0-521-24334-6. ↑ Guy (1987), p. 167. ↑ Guy (1987), p. 166. ↑ Elliott (2000), p. 615-617. ↑ Elliott (2009), p. 5. ↑ Elliott (2009), p. 57. 1 2 Elliott (2009), p. 145. ↑ Elisabeth Benard, "The Qianlong Emperor and Tibetan Buddhism," in Dunnell & Elliott & Foret & Millward 2004, pp. 123-4. ↑ Lopez 1999, p. 20. ↑ Berger 2003, p. 35. ↑ Berger 2003, p. 34. ↑ Le Bas, Jacques-Philippe (1770). "A Victory Banquet Given by the Emperor for the Distinguished Officers and Soldiers". World Digital Library (in French). Xinjiang, China. ↑ Jacques Gernet (31 May 1996). A History of Chinese Civilization. Cambridge University Press. p. 522. ISBN 978-0-521-49781-7. Retrieved 28 May 2013. ↑ Crossley 1999, pp. 55-56. ↑ Elliott (2001), pp. 184-186. ↑ Crossley 1999, pp. 291-292. ↑ Crossley 1999, p. 293. ↑ Elliott 2001, p. 133. ↑ H.S. Brunnert; V.V. Hagelstrom (15 April 2013). Present Day Political Organization of China. Routledge. pp. 493–494. ISBN 978-1-135-79795-9. ↑ "Archived copy". Archived from the original on 25 April 2016. Retrieved 20 May 2016. ↑ Evelyn S. Rawski (15 November 1998). The Last Emperors: A Social History of Qing Imperial Institutions. University of California Press. pp. 72–. ISBN 978-0-520-92679-0. ↑ Zhao 2006, p. 4. ↑ Zhao 2006, pp. 11-12. ↑ Millward 1998, p. 25. ↑ "Qianlong(in Chinese text)". hudong.com. Retrieved 24 October 2008. For a critique of the above narrative, see James L. Hevia, Cherishing Men from Afar: Qing Guest Ritual and the Macartney Embassy of 1793. (Durham: Duke University Press, 1995). For a discussion on Hevia's book, see exchange between Hevia and Joseph W. Esherick in Modern China 24, no. 2 (1998). ↑ Æneas Anderson, A Narrative of the British Embassy to China, in the Years 1792, 1793, and 1794; Containing the Various Circumstances of the Embassy, with Accounts of Customs and Manners of the Chinese (London: J. Debrett, 1795) p. 176. ↑ Robbins, Helen H. (1908). "Our First Ambassador to China: An Account of the Life of George, Earl of Macartney, with Extracts from His Letters, and the Narrative of His Experiences in China, as Told by Himself, 1737-1806". London: John Murray. p. 386. Retrieved 25 October 2008. ↑ Duyvendak, J.J.L. (1937). 'The Last Dutch Embassy to the Chinese Court (1794–1795).' T'oung Pao 33:1–137. ↑ van Braam Houckgeest, Andreas Everardus. (1797). Voyage de l'ambassade de la Compagnie des Indes Orientales hollandaises vers l'empereur de la Chine, dans les années 1794 et 1795; see also 1798 English translation: An authentic account of the embassy of the Dutch East-India company, to the court of the emperor of China, in the years 1974 and 1795, Vol. I. ↑ van Braam, An authentic account..., Vol. I (1798 English edition) pp. 283–288. 1 2 World Monuments Fund. "Juanqizhai in the Qianlong Garden". World Monuments Fund. Retrieved 16 July 2011. ↑ Draft history of the Qing dynasty, Consort files. 《清史稿》卷二百十四．列傳一．后妃傳. Berger, Patricia Ann (2003). Empire of Emptiness: Buddhist Art and Political Authority in Qing China (illustrated ed.). University of Hawaii Press. ISBN 0824825632. Retrieved 10 March 2014. Clarke, Michael Edmund (2004). "In the Eye of Power: China and Xinjiang from the Qing Conquest to the 'New Great Game' for Central Asia 1759–2004". Griffith University, Brisbane: Doctoral thesis, Dept. of International Business & Asian Studies. Archived from the original (PDF) on 11 February 2011. —— (2001). The Manchu Way: The Eight Banners and Ethnic Identity in Late Imperial China. Stanford University Press. ISBN 0804746842. Retrieved 10 March 2014. —— (2009). Emperor Qianlong: Son of Heaven, Man of the World. New York: Pearson Longman. ISBN 9780321084446. Guy, R. Kent (October 1987). The Emperor's Four Treasures. Harvard University Press. p. 167. ISBN 978-0-674-25115-1. Hall, D.G.E. (1960). Burma (3rd edition ed.). Hutchinson University Library. ISBN 978-1-4067-3503-1. Lopez, Donald S. (1999). Prisoners of Shangri-La: Tibetan Buddhism and the West (reprint, revised ed.). University of Chicago Press. ISBN 0226493113. Retrieved 10 March 2014. Newby, L. J. (2005). The Empire And the Khanate: A Political History of Qing Relations With Khoqand C.1760-1860. Volume 16 of Brill's Inner Asian Library (illustrated ed.). BRILL. ISBN 9004145508. Retrieved 10 March 2014. Rawski, Evelyn S. (1998). The Last Emperors: A Social History of Qing Imperial Institutions. University of California Press. ISBN 052092679X. Retrieved 10 March 2014. Reardon-Anderson, James (Oct 2000). "Land Use and Society in Manchuria and Inner Mongolia during the Qing Dynasty". Environmental History. Forest History Society and American Society for Environmental History. 5 (No. 4): 503–530. JSTOR 3985584. Robbins, Helen Henrietta Macartney (1908). Our First Ambassador to China: An Account of the Life of George, Earl of Macartney with Extracts from His Letters, and the Narrative of His Experiences in China, as Told by Himself, 1737–1806, from Hitherto Unpublished Correspondence and Documents. London : John Murray. [digitized by University of Hong Kong Libraries, Digital Initiatives, "China Through Western Eyes." Scharping, Thomas (1998). "Minorities, Majorities and National Expansion: The History and Politics of Population Development in Manchuria 1610-1993" (PDF). Cologne China Studies Online – Working Papers on Chinese Politics, Economy and Society (Kölner China-Studien Online – Arbeitspapiere zu Politik, Wirtschaft und Gesellschaft Chinas). Modern China Studies, Chair for Politics, Economy and Society of Modern China, at the University of Cologne (1). Retrieved 14 August 2014. Van Braam Houckgeest, Andreas Everardus. (1798). An authentic account of the embassy of the Dutch East-India company, to the court of the emperor of China, in the years 1974 and 1795, Vol. I. London : R. Phillips. [digitized by University of Hong Kong Libraries, Digital Initiatives, "China Through Western Eyes." Woodside, Alexander. "The Ch’ien-Lung Reign," in Peterson, Willard J. (December 2002). The Cambridge History of China. Cambridge University Press. pp. 230–309. ISBN 978-0-521-24334-6. Zhao, Gang (January 2006). "Reinventing China Imperial Qing Ideology and the Rise of Modern Chinese National Identity in the Early Twentieth Century". 32 (Number 1). Sage Publications. doi:10.1177/0097700405282349. JSTOR 20062627. Archived (PDF) from the original on 2014-03-25. Retrieved 17 April 2014. Ho Chuimei, Bennet Bronson. Splendors of China's Forbidden City: The Glorious Reign of Emperor Qianlong. (London: Merrell, in association with The Field Museum, Chicago, 2004). ISBN 1858942039. Kahn, Harold L. Monarchy in the Emperor's Eyes: Image and Reality in the Ch'ien-Lung Reign. (Cambridge, Mass.,: Harvard University Press, Harvard East Asian Series, 59, 1971). ISBN 0674582306. Kuhn, Philip A. Soulstealers: The Chinese Sorcery Scare of 1768. (Cambridge, MA: Harvard University Press, 1990). ISBN 0674821513 (alk. paper). James A. Millward, Ruth W. Dunnell, Mark C. Elliot and Philippe Foret. ed., New Qing Imperial History: The Making of Inner Asian Empire at Qing Chengde. (London; New York: Routledge, 2004). ISBN 0415320062. Nancy Berliner, "The Emperor's Private Paradise: Treasures from the Forbidden City" (New Haven: Yale Univ. Press, 2010) ISBN 978-0-87577-221-9. Ch'ien Lung (emperor of China.) (1810). The conquest of the Miao-tse, an imperial poem ... entitled A choral song of harmony for the first part of the Spring [tr.] by S. Weston, from the Chinese. Translated by Stephen Weston. LONDON: Printed & Sold by C. & R. Baldwin, New Bridge Street, Black Friars. Retrieved 24 April 2014. Wikimedia Commons has media related to Qianlong Emperor.